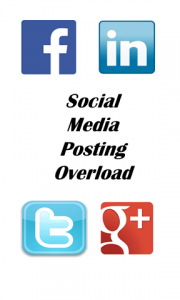 Home Sales & Marketing Social Media Social Media: Should I Post if I Have Nothing to Say? Social Media: Should I Post if I Have Nothing to Say? I did a post the other day on my Facebook page that asked the question: if you don’t have anything to say, should you post anyway? This is something that I’ve been struggling with for a while now and I know it goes against everything that’s ever been written about social media. The experts say that you should be posting to social media on average anywhere from 2 – 20 times per day, depending on the platform, but what do you post that hasn’t already been posted by other people hundreds or even thousands of times already and doesn’t involve pictures of your children, pets, or your plans for the day? I’m not an expert at social media so I won’t even attempt to trot out any statistics or best practices because they’ve all been written about by people far more knowledgeable than myself, but how do I find that sweet spot between what the experts say I should do and what I personally feel I should do? I’ve seen a lot of repetitive posts on Facebook, Twitter, and Google+ and while I can understand it if you’re promoting a blog post, article, or product, I can’t understand it if you’re doing it just so you can meet your quota of posts for the day. And that brings me back to my original question: if you don’t have anything to say, should you post anyway? Personally, I find it annoying to read the exact same thing on every platform I’m on and think it’s a bit lazy not to try and come up with original content for each of your platforms. I understand how hard this can be and I understand the theory behind carbon copying your content but that is not my style and maybe that is why I will never have a huge audience. I say this not to criticize those who do this because you have to do what works for you but that is why I choose not to post everyday because sometimes I really don’t have anything to say and instead of posting just because I would rather stay silent. I know this way of thinking goes against all conventional wisdom when it comes to social media, but the experts also say that you should be yourself. If being myself means I go dark for a day or two isn’t that better than seeing yet another picture of my dogs (although they’re pretty damn cute) or hearing what I had for lunch? Previous articleBreast Cancer: Beware the booby-traps this October . . . I totally agree with what you’re saying. I sometimes feel like myself. My husband tells me to post my product on FB every hour…at least 3 just to get it out there into the FB world. I did that for a few weeks but them felt I was bombarding the ‘friends’ so I just do it less. I’ve even read where if you post a question about whatever that it would be engaging. Well, I did that a few times and nothing. So I don’t put out questions. I’ll comment all day long to other posts, though and will get a good conversation going which is good I guess. I’m good at staying silent for a few days or I will make myself busy with other projects. Twitter is kind of good because you can keep it short and move on. Great post and thanks for making me feel that I’m not alone! I completely agree with you on posting the exact same things across every one of our social networks – especially we’re working off of one like Instagram and have it automatically share to all the others. No one wants to have to go from Twitter or Facebook to Instagram just to see a picture. On the other hand, I also think that it’s okay to share the same content if you find different ways to share it for each platform. Maybe share a different picture, different quote or passage from an article, etc. and then tailor it specifically to the network being posted to. …As small business owners, yes we want to get our products and services out there, but we should always keep in mind our audience/potential customer as well. Thank you so much Marcelle and Sherri for the comments! It’s so hard to find the balance between saying too much and not saying enough, sounding like a broken record and posting original content. That’s why when I really feel like I don’t have anything at least some what constructive to say or add anything to the conversation, I will just stay offline. There is so much to social media and it moves and changes so fast; I want to be sure I’m adding something to the general conversation and not just shouting in the wind! I recently put my own blog on hiatus. It was a very difficult decision, but I picked up a very large contract demanding much of my time, and I wanted to focus on other creative pursuits. Furthermore, I had really take my blog about as far as it could go. I decided, along with my other projects, I would focus “blog time” on more — and shorter — communications through social media channels. The point is that there is far more drivel out there than we could ever hope to read, so unless you have something that will add value to someone’s business and/or life, don’t post just to post. er… that is DON’T SAY anything at all. Sheesh, that’s what I get for posting before coffee! My apologies.